How do I install the HP Photosmart C4585 cartridges again please? Are HP 364 ink cartridges compatible with an HP C4585 wireless printer please? Our previous cartridges are numbered as HP 350 for the black ink and HP 351 for the tri-colour? The HP Photosmart C4585 All-in-One printer uses the HP 350 / 350XL black ink cartridges and the HP 351 / 351XL colour ink cartridges as listed above. These are the cartridges you've previously been using and you must continue to buy these as HP 364 ink cartridges aren't compatible with this printer. I'm changing both my HP Photosmart C4585 cartridges but unsure how? Allowing you to print all the time, the HP Photosmart C4585 is a great choice for individuals who want high quality photo prints. The Photosmart C4585 is extremely efficient and speedy, allowing you to use your HP Photosmart C4585 for any printing situation. Ideal for creating photographs, the HP Photosmart C 4585 requires a number of HP Photosmart C4585 cartridges like the black HP Photosmart C4585 ink cartridge which eventually run out over time. Replacing your HP Photosmart C4585 ink cartridges all the time can be expensive as leading HP Photosmart C-4585 prices can be extremely high. Luckily we are entirely committed to getting you cheap Photosmart C 4585 ink so that you can save as much as possible- just compare our discount HP Photosmart C4585 cartridge prices with other HP Photosmart C4585 stores to find out! Getting you cheap HP Photosmart C4585 ink is what we do best and we add great service to the deal so you get your Photosmart C-4585 cartridge with very little trouble. Every HP Photosmart C-4585 ink cartridge that we send off has a money back guarantee so that we can let you know that we only deal with top quality HP Photosmart C4585 cartridges or you get all your money back. Our HP Photosmart C4585 ink cartridges are also sent off via free delivery so that you can receive your HP Photosmart C 4585 ink for no extra fee. A Photosmart printer could be a very good addition to your home set up and the HP Photosmart C4585 is a very good example of the kind of quality which HP currently provide. Many will overlook such an item as there are some very stylish, more up to date models out there at the minute so, in a bid to help you gain a further understanding of the potential benefits which may be experienced, here are a few of the potential benefits of an HP Photosmart C4585. The design of the HP Photosmart C4585 is certainly worth noting and though it is very rare for a printer to be pleasing on the eye, the HP Photosmart C4585 has clearly been designed by a team in the know. A subtle white finish is offset by a curved body, making for an unassuming and attractive printer. 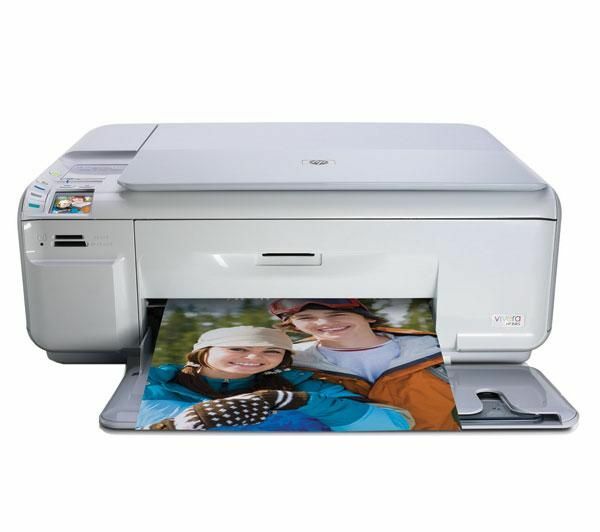 The cost effective nature of the HP Photosmart C4585 is perhaps the most beneficial aspect of this stylish item. The amount of money you may be required to hand over in order to pick up a HP Photosmart C4585 is very small as it is not one of the newest models in the range. Still, just because it's affordable, this doesn't mean for a moment that the quality of this printer is questionable. Print outs are often very pleasing on the eye, both photographs and text documents. The HP Photosmart C4585 does have its limitations, but it is still a very effective, highly affordable product and not every printer can boast both of these credentials. As such, if you're happy to pick up a printer which is not exactly new, but still something of a gem then you might just benefit from considering the HP Photosmart C4585.